Affordable housing is an essential element in the well-being of New Jersey’s citizens and the economic success of the state. The lack of affordable housing hinders economic growth, since without affordable housing for employees, it is difficult for firms to maintain their workforces. Our economy is held back when significant numbers of our citizens have little money to spend and invest due to the high cost of housing. However, most of all housing is a fundamental need of all people. Living in expensive, poorly maintained housing makes it difficult for families to improve their lives and those of their children, much less contribute to the community. Although conventional wisdom holds that the affordable housing stock is at risk throughout the United States, New Jersey rents have become somewhat more affordable during the last decade. As Figure 19.1 shows, more renters could afford both one bedroom and two bedrooms units in 2000 than in 1989.1 The share rose from 53% to 64% for one-bedrooms, and from 46% to 56% for two-bedrooms. However, despite these increases, some 40% of New Jersey renters still can’t afford fair market housing, which is clearly a matter for major concern. In 2000 New Jersey ranked 39th among 51 states in affordability for two-bedroom units, and 43rd for one-bedroom units. 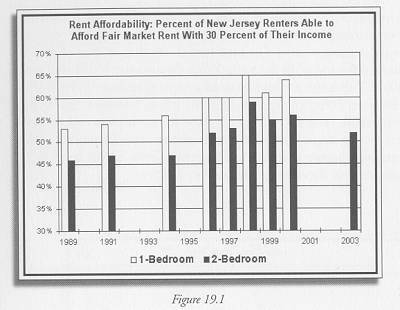 Figure 19.1 shows the share of renting households that can afford “fair market rent” with 30 percent of their income. This follows the generally accepted rule of thumb that a household should pay no more than 30 percent of its annual income on housing. Fair market rents are estimated each year for use in the Section 8 rent voucher program2 which subsidizes the rents of low-income households. They include rent plus all utilities except telephone. They are generally set at the 40th percentile point for rents for apartments of a standard size and quality within the geographic area under consideration. For example, the rents for all standard two-bedroom apartments in one city would be ranked. The fair market rent would be the level of rent at which 40% of the apartments are cheaper and 60% are more expensive. The vacancy rate in rental housing gives some idea of the pressure on the rental market, and the difficulty of finding any housing. 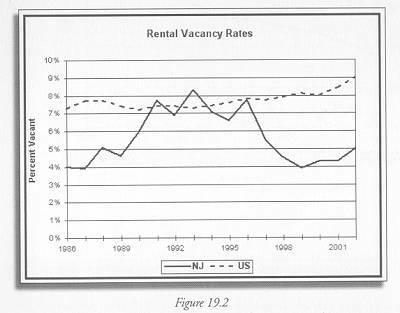 As Figure 19.2 shows, rental vacancies in New Jersey have been well below the US average for most of the past fifteen years. In 2002, New Jersey ranked 45th in the nation in vacancies, indicating an extremely tight market. (1) This calculation is not available from the National Low Income Housing Coalition for 2001 or 2002. (2) Section 8 refers to the part of the United States Housing Act of 1937 that created this program.